In my previous blog post I talked about my friend Barbara Alkema who might be my new roommate along with her adult son Josh and their 4 cats. You can read the details about that here. 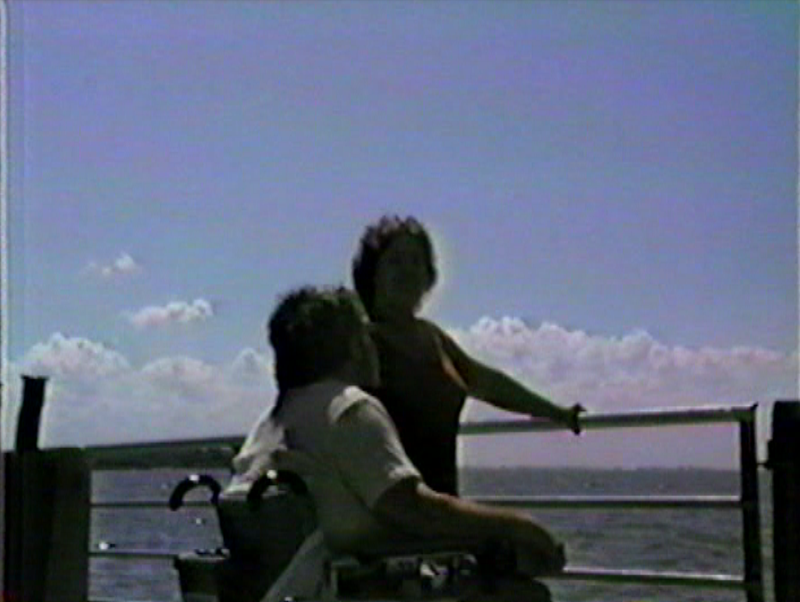 I mentioned in that blog that in 1986 Barb drove from her home in Toledo down to Indianapolis, picked me up in my van, and drove me back to Toledo to spend a week vacation with her and my friend Jim Grubs. I had met Jim online on CompuServe on a disability forum. He had a type of muscular dystrophy different from mine. Barb was his live-in caregiver. We all became friends online. This blog is the story about that vacation that I spent with her and Jim. Actually Jim lived in Sylvania which is a suburb of Toledo. Anyway this was a really big deal for me because it was the first time I had been anywhere overnight or under the care of anyone other than my parents. It was a big milestone for me in my independence. It served as proof of concept that let me take other out-of-town trips with other friends years later. The drive to Toledo was uneventful. I don’t really remember any details of it. Google maps (which didn’t exist in those days) tells me today that it is a 224 mile journey that should take three hours 48 minutes. Barb rearranged some furniture in Jim’s bedroom and they rented a hospital bed for me for the week. We took my Hoyer lift and my oxygen machine. This was decades before I had a CPAP, ventilator, trach or G-tube. I just had oxygen that I used at night. Jim did as well although I think he may have had a CPAP I don’t recall. Barb did double duty taking care of both of us. We visited with friends of theirs and went out to dinner a couple of times. We would drive from Toledo to Catawba Island just north of Sandusky. There you catch a ferry boat out to South Bass Island. You can click on the maps in this blog for a larger version and each has a link where you can to go to Google maps to see more details. When we got to the ferry landing they told us that we could not take our vehicle with us because they had already taken over a large number of vehicles for the day. There’s only so much room for cars on the boat and there was a chance that there would not be room for us for the return trip. 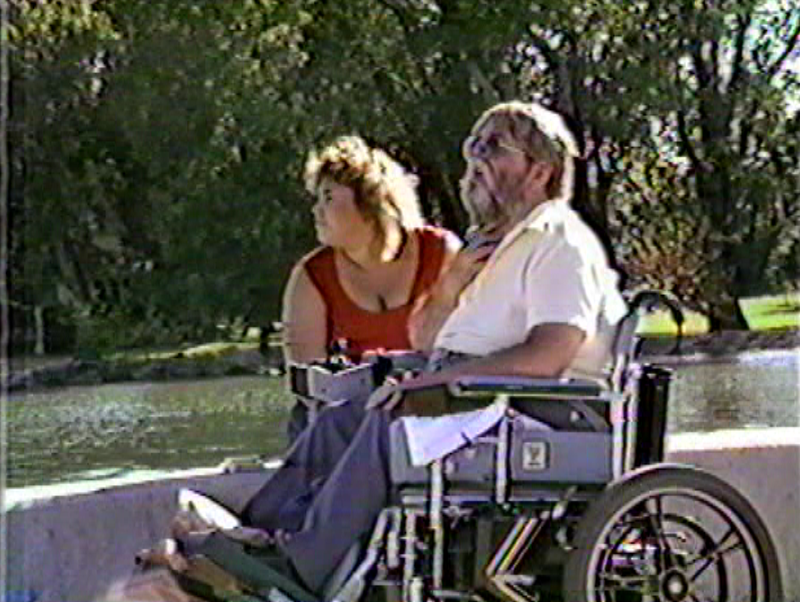 So we parked the van at a parking lot about a block away and got on the boat just in our wheelchairs with Barbara on foot. I had my VHS camcorder with me and I shot video along the way. You can see the YouTube version at the end of this blog. Some of the images in this blog are screen grabs from that video. Unfortunately the railing on the ferry had a bar exactly at the height of my video camera so it was a little bit difficult to shoot video out across the water. Most of the passengers road up high on an upper deck that gave them a great view but we stayed on the main deck with the vehicles that were going across. A couple of seagulls flew alongside us on the journey. We could see other boats out on Lake Erie and another ferryboat passed us going the other way. Growing up severely landlocked here in Indianapolis, being able to look out to the horizon and see endless water is a strange experience for me. I’ve never been to the ocean. I have been to Chicago on a couple of occasions and seen Lake Michigan but I had never been out on it in a boat. South Bass Island is only 2.9 miles from shore so we could see it from the shore where we departed. But there were directions you can look out into the lake and it was water all the way to the horizon. For most people it wouldn’t be a big deal but it was a new experience for me. When we got to the landing at the south tip of South Bass Island we realized we were in trouble. We were at the wrong end of the island. We had no idea how far we would have to walk. Most people who got off the ferry went to the bicycle rental stand but that wasn’t going to work for us. As this Google map below shows, it’s 2.2 miles. Had we been in the van it would’ve been a six minute drive from one end of the island to the other. On foot it’s 46 minutes. And with two electric wheelchairs and an aide on foot it was probably longer than that. Of course we didn’t have Google maps in those days or smart phones with which to check Google maps. Not knowing what we were up against we had no choice but to set out on foot. We passed by a small airport on the island and sat and watched a couple of private planes land and take off. 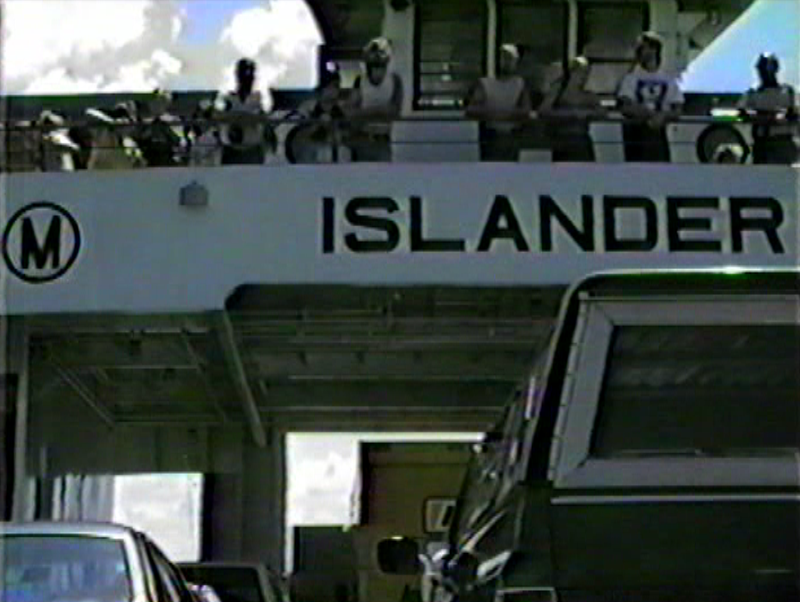 There is also an air service called Island Airlines that will take you out to the island. Jim saw one of them flyover while we were on the ferryboat. Somewhere along the way we came across a little hamburger stand with some picnic tables sitting in front of it so we stopped and had lunch. You can see the Perry Monument off in the distance and it looked like it was just over the hill a bit. But I had no idea just how tall the thing really was. (Again we couldn’t Google it.) We were still over a mile away. When we finally got to the town of Put-in-Bay it was very nice. There was a nice marina with lots of expensive looking boats. One of them looked like a big offshore racing boat. Others were fancy cabin cruisers. We didn’t really spend any time in the tourist trap shops. We went on to the big Memorial to get a good look at it. Now we could see just how huge it really was. There was a small shack that was sort of like a mini museum. 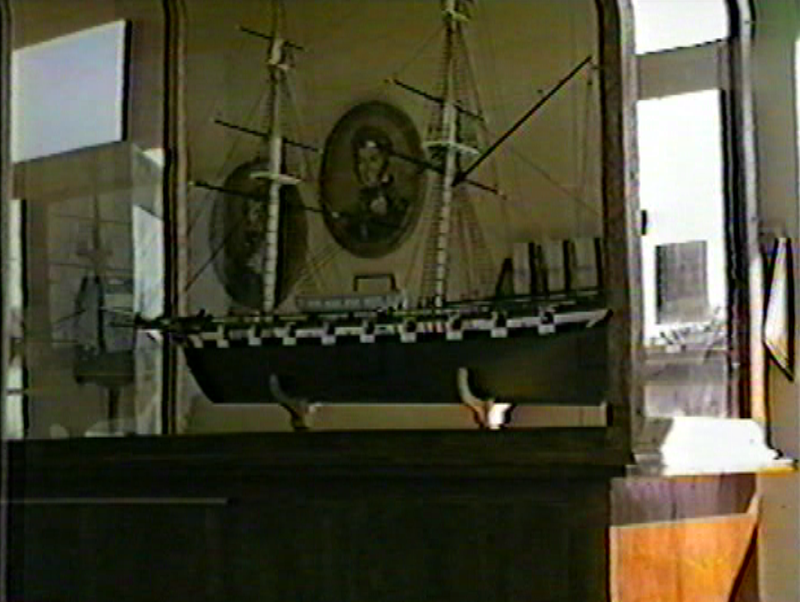 I shot some video of a really cool scale model of the USS Lawrence which was Commodore Perry’s flagship during the battle of Lake Erie. His motto and battle flag bore the phrase “Don’t Give up the Ship”. This was a paraphrasing of the dying words of Capt. James Lawrence who was a friend of Perry and who had died in an earlier battle in the war. We hung out in the park for a while and it was very peaceful. The island has a very narrow Isthmus right at that point and you can see water on either side. The bay itself is very calm compared to the waters of Lake Erie. The problem now was how to get home. There was no way we could make it back to the other end of the island where we had landed in time to catch the last boat home. Fortunately there is a ferryboat that leaves directly from the bay. 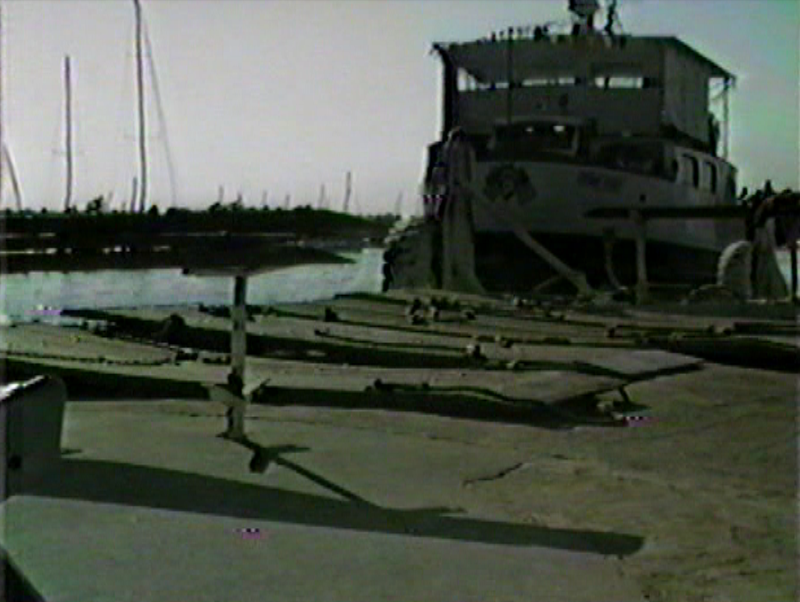 Had we known what we were doing, we would’ve taken the boat that landed there. So we purchased a ticket to go back on a different ferry from this different departure point. There was another problem however. This ferry did not go back to the Catawba Island Terminal where we left the van. 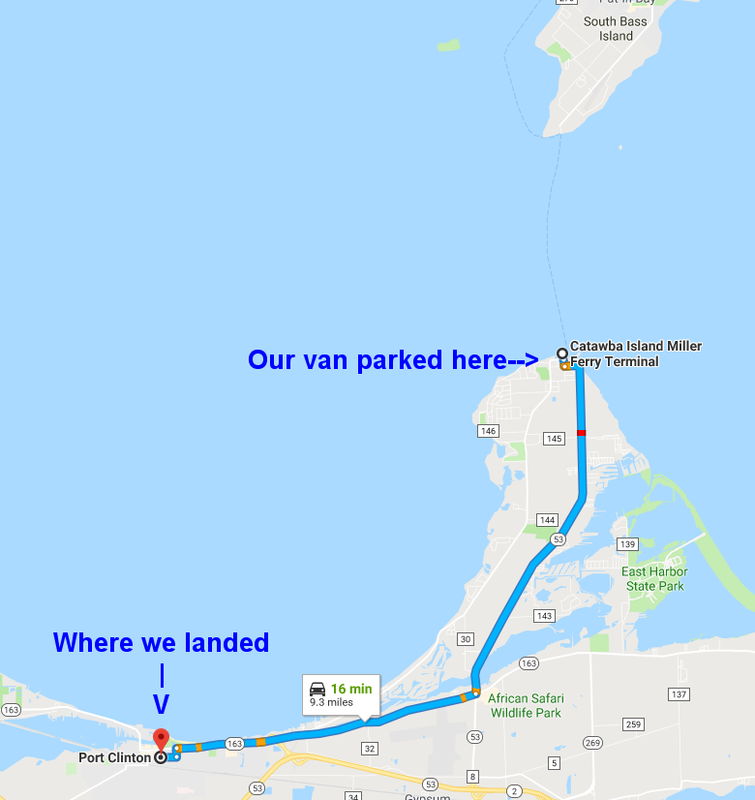 Instead it went back to a place called Port Clinton which is 9 miles away from where the van was. We didn’t have any other choice. We had to take this ferry home. We depart from the north side of the isthmus and had to go around the east end of the island to get back to the shore. It gave us a nice scenic view of the island. On the trip out there were seagulls that flew alongside us but on the trip home there were many more birds and they would fly up to the rear of the ship and the passengers would throw breadcrumbs to them. You could buy a package of breadcrumbs on the fairy. The birds would swoop down and catch them in midair. One person tried holding out their hand palm up with food in it but I never saw a bird swooped down to take it. I wouldn’t have done that. 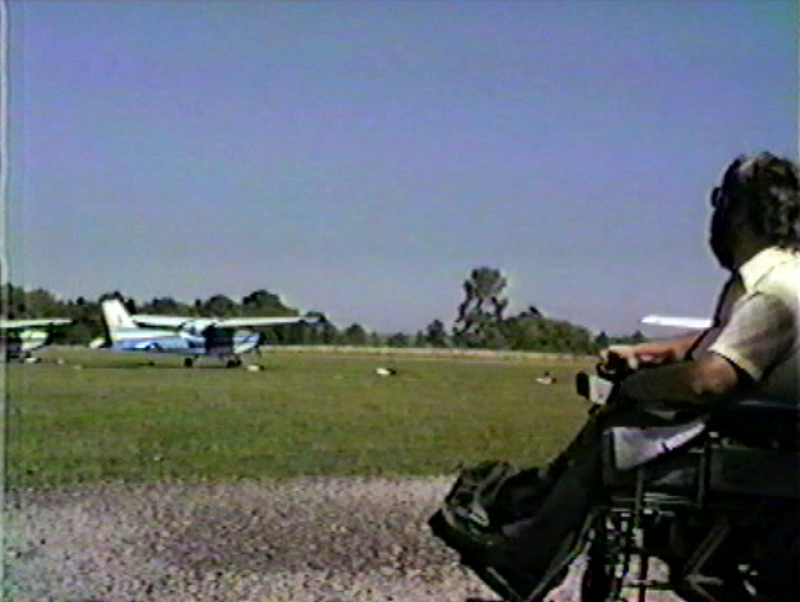 When we landed at Port Clinton we called a taxi and Barb left Jim and me alone in the parking lot while she went to get the van 9 miles away. Then she drove the van back to pick us up. There was another guy there in a wheelchair with his own van but there would be no room for three wheelchairs in his van so we didn’t even bother to ask him if we could bum a ride. There was some sort of fast food restaurant across the street and we thought about going to get something to eat while we waited but we decided it was best to just stay put. We felt safe where we were. There are actually 2 different fairy routes that leaves the north side of the island and they go to 2 different locations on the shore. One of them went to Marblehead and the other to Port Clinton. I couldn’t remember which route we went but I did remember that Barb said the taxi ride was 9 miles. 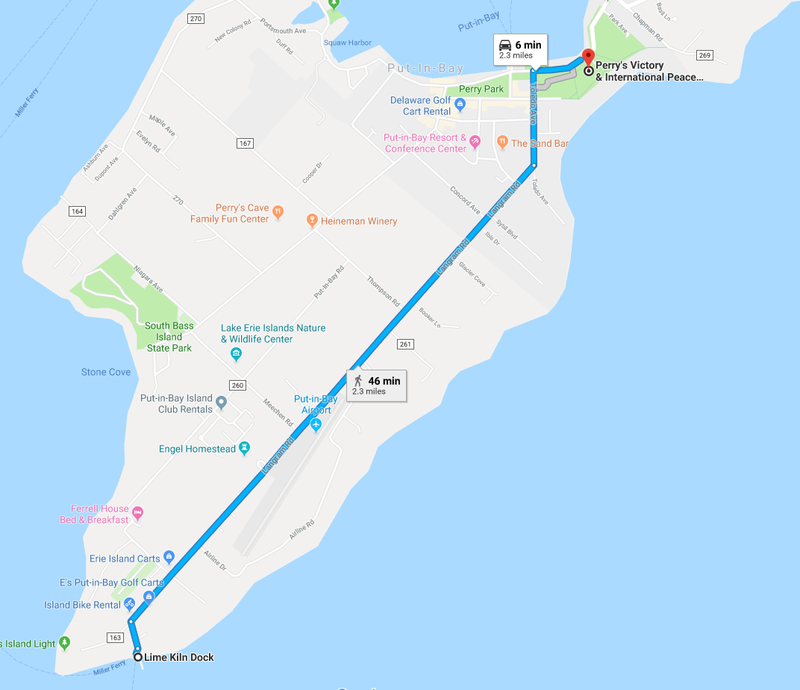 So in researching for this blog I used Google maps and discovered that it was Port Clinton and not Marblehead where we returned. 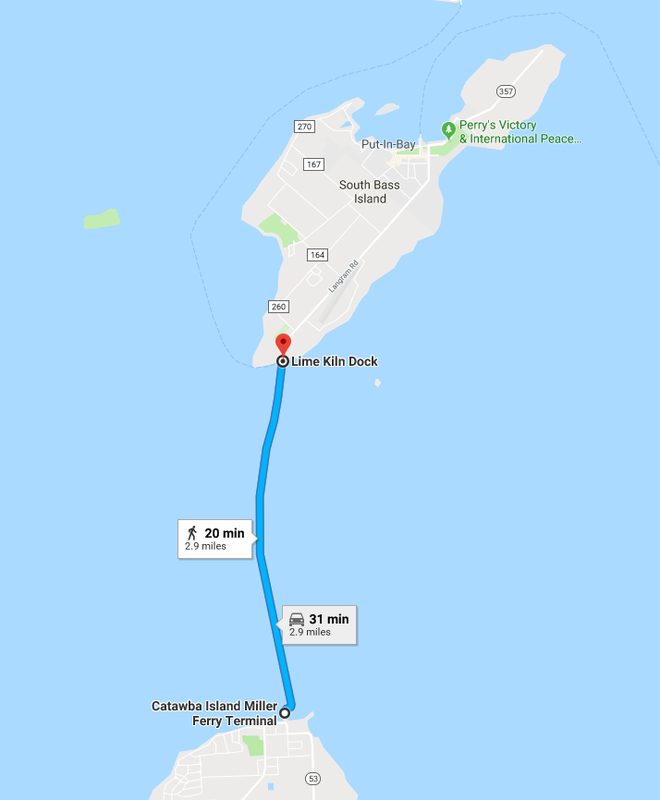 Marblehead is 11 miles from Catawba Island according to Google maps. Recalling this whole experience from 1986 has really opened my eyes to how dependent we are in this day and age on the Internet and all of the resources it provides. It makes me wonder how we ever survived without it. The journey back to Toledo was uneventful. When we got home we ordered some pizza. We were all pretty exhausted from our adventure especially Barb who had walked the length of the island and still had to put Jim and me to bed. We had plans for the next day to drive to Detroit to visit a CompuServe friend of mine but we decided to cancel because we had already had enough adventure for now. Barb and I left Jim in the capable hands of his backup aide Dede and we drove onto Chicago to visit other friends there. We had a great time in Chicago for the weekend. I don’t remember why but I did not shoot any video for this leg of the trip. Now I wish I had. Didn’t take any photos either.We got in a huge traffic jam coming through the interstate in Chicago. We also drove by Soldier Field where the Indianapolis Colts were playing the Bears in a preseason football game. I thought it was ironic that I was in town for a Colts game without tickets to see it. We got lost once along the way trying to find the hotel where I had booked us a room. We eventually made it to the right place and checked in. I had my laptop with me and I logged into CompuServe to touch base with friends. They started teasing me about spending a weekend in a hotel room with a nurse. Barb didn’t appreciate that. Barb met up with a friend of hers who lived in Chicago and he hung out with us and spent the night. I don’t remember his name or how she knew him. I had dinner with a friend from CompuServe. Sadly I don’t remember her name either. This was my third trip to Chicago. The first was a family vacation when I was 13. I always tell people “Yeah… I was in Chicago in ’68. The scene with all the hippies in Grant Park was wild.” The truth was that vacation was the week before the infamous 1968 Democratic National Convention with all of its riots and controversy. And I neglect to tell people I was only 13 at the time and was on vacation with my mommy and daddy. My second trip to Chicago had been just a few years prior in 1981 when I was invited to exhibit some software in the “John’s Hopkins First National Search for Computer Applications for the Handicapped“. My software VersaScan won seventh place in the Midwest regional and was one of the top 100 in the country. (See page 276 of this PDF “Communicating with Tokens” by Chris E. Young) That event was held in the Museum of Science and Industry so I got to spend lots of time there as well as my other favorite museums. I definitely wanted to go to the Museum of Science and Industry because they had just installed a new OmniMax Theater. If you’ve never heard of it, OmniMax is a domed version of IMAX. Some theaters refer to it as IMAX Dome while others continue to use OmniMax. 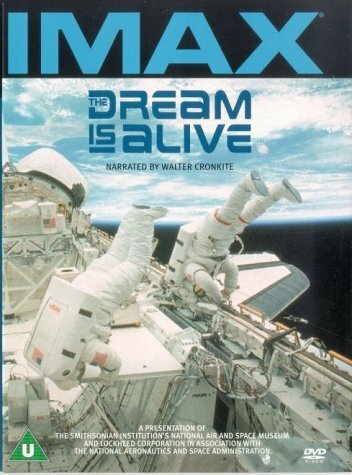 The film was a NASA documentary called “The Dream Is Alive“. This 1985 film was made during space shuttle mission STS 41C aboard the space shuttle Challenger. Ironically in January 1986 a tragic accident destroyed the Challenger and its crew of seven and the dream was almost destroyed with it. It would be two years before shuttles flew again. It was bittersweet to see the Challenger in such a magnificent format. We didn’t have time to tour the entire museum. We just went directly to the OmniMax theater. Unfortunately when we got there, the show was sold out. Some nice man who was in line with his family gave me his ticket for free. Barb waited in the lobby for me. The show was only about 45 minutes. It was the first IMAX film I had ever seen. The OmniMax Theater screen is huge. It’s like you took a dome and tilted it on its side and suspended it above the stadium seating. If you would stare at the center of the screen and did not look side to side, the image would fill your entire field of vision. The multichannel digital surroundsound was state-of-the-art. You can feel the floor shake when the shuttle took off. I’ve got a DVD of that film but of course watching it at home even in HD with my home surround system is nothing like IMAX. I was instantly hooked and I’ve been an IMAX addict ever since. I wished we had IMAX theaters in Indianapolis. In 1996 my wish came true. The Indianapolis Children’s Museum opened a theater called the CineDome. While not technically IMAX nor OmniMax, it was much like a smaller version of the OmniMax in Chicago with a domed screen. Although built by iWerks and not IMAX it would still show 1570 format films some of which were IMAX films. In 2002 the Indiana State Museum opened an IMAX with a traditional flat screen but it had 3D capability. The CineDome closed in 2003 and the museum turned it into a dinosaur exhibit called Dinosphere which is pretty cool but I still miss the CineDome. There are now 3 other IMAX theaters in the central Indiana area but they are smaller digital IMAX facilities as part of a multiplex of other theaters. Purists call these smaller theaters lie-Max but I still like them. Still they don’t compare to the large IMAX at the Indiana State Museum or the Chicago OmniMax. In 2017 the Chicago OmniMax theater was renovated and the IMAX film projector removed. It was replaced by a laser digital projection system and was renamed the Giant Dome Theater. Maybe someday I will go back and see how the upgrade looks. But I still have fond memories of the original OmniMax and my first IMAX experience. The journey home to Indianapolis the next day was uneventful. Barb drove back to Toledo. We stayed in touch but I did not see her again until 1990. By then she had a boyfriend and a baby. She was leaving Jim to move to Texas. She did return to Toledo a few years later to care for Jim but sadly he passed away in 1995. She then went to school and got a job doing the social work. We’ve stayed in touch via Christmas cards, email, and an occasional phone call. I will see her again in a couple of weeks when she will come visit and we will decide if she’s capable of helping out as my caregiver. If so she and Josh and their cats will move here. I really hope it works out. Regardless of what happens, I will always cherish these great memories we’ve made together for over 30 years.